Confirmed Enterobacteriaceae results in 24 hours. This plate has been awarded Official Methods of Analysis (OMA) #2003.01 and NF VALIDATION certificate: 3M 01/6-09/97 by AFNOR Certification. 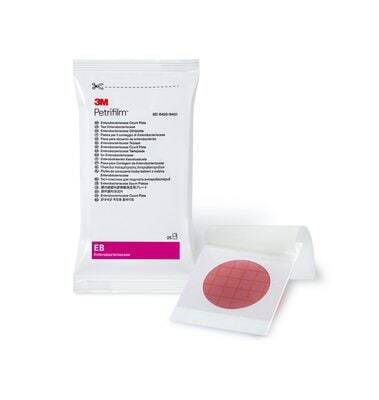 3M™ Petrifilm™ Enterobacteriaceae Count Plates enumerate coliforms plus potential pathogens and identify contamination. 3M™ Petrifilm™ Enterobacteriaceae Count Plates enable you to quickly determine potential sources of contamination. This plate enumerates all coliforms as well as potential pathogens such as Salmonella, Shigella and Yersini. The 3M Petrifilm Enterobacteriaceae Count Plate can also be read using the 3M Petrifilm Plate Reader which provides consistent, fast, automated reading and recording of results of 3M Petrifilm Plates (Aerobic Count, Rapid Aerobic Count, Coliform Count, E. coli/Coliform Count, Enterobacteriaceae Count and Select E. coli Count ) in 4 seconds. The 3M Petrifilm Plate Advantage In today’s environment of heightened focus on food safety and increasingly stringent quality requirements, labs are under pressure to provide tests that are fast, reliable and consistently accurate. 3M Petrifilm Plates have demonstrated consistent performance that has been cited globally with more than 200 certificates, recognitions, validations, and peer-review publications. For more than 30 years, food safety professionals around the world have put their trust in 3M Petrifilm Plates. That’s because 3M Petrifilm Plates have streamlined, standardized and simplified the process of microbial quantitative indicator testing, improving productivity and helping ensure the highest levels of product quality.